“We live in a noisy world, full of distractions and idle talk. This endless stream of words can leave us even more empty and disconnected.” Sarah Colyn speaks on the importance of daily silence in the midst of our busy lives. 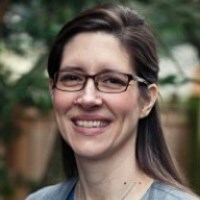 She is Director of Ministries of MPC, and is also the founder and director of Sanctuary Psychological Services in Edmonds, Washington. She holds a BA from Calvin College, and an MA in Christian Leadership and a PhD in Clinical Psychology from Fuller Theological Seminary. She is an active member of North Sound Church, grew up in the Christian Reformed church and has been mentored by Pentecostal, Catholic, and Evangelical Christian leaders. Sarah and her husband Mike have been blessed with over twenty years of marriage. They live in Washington state with their daughter and two sons.